Info: Ever wonder how the world looks to an insect? Well, now you'll know with these Fly Vision Prism Glasses! Adjust the dials and experience "kaleidoscope eyes". 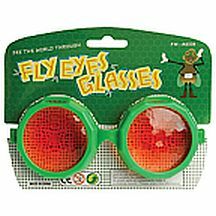 These fun glasses are the perfect tool to teach optics, perception and insect vision!